Bridgestone has designed the Dueler A/T 694 to meet the growing demand from urban drivers for rugged, all-terrain patterns. This new tyre keeps the capability and appeal of an aggressive all-terrain look, while providing outstanding on-road performance, especially in the wet. Applied for the first time on a Bridgestone 4X4 tyre, the Dueler A/T 694 incorporates 'Shark Skin' technology that reduces flow resistance on the groove walls, improving drainage away from the blocks and reducing hydroplaning. High-density siping provides more edges to bite into wet and snow. 3D Z-shaped sipes, which increase in length as the tread block wears, maintain this bite to give consistent grip throughout tyre life. The tread blocks are shaped to equalise contact pressure distribution, thus raising overall performance and reducing wear rate. 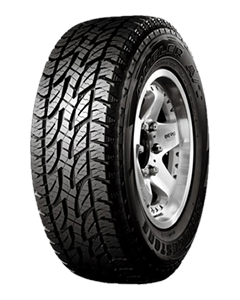 Sorry, we currently do not have any tyres with the Dueler A/T 694 pattern in stock.